A high-tech entrepreneur has unveiled plans to launch the world's most powerful rocket since man went to the moon. The rocket could lift twice as much cargo into orbit as the soon-to-be-retired space shuttle. the moon was bigger. Space X president and CEO Elon Musk said that Falcon Heavy will be far cheaper than government or private rockets. Launches are about $100 million each. The first launch is slotted for 2013 from California. "This is a rocket of truly huge scale," Elon Musk said during a press conference at the National Press Club in Washington. Potential customers are NASA, the military, other governments and satellite makers. Musk founded PayPal and launches smaller rockets. The planned rocket is expected to carry twice the payload-carrying capacity of the current space shuttle, or roughly 117,000 pounds of cargo into orbit. According to SpaceX, the only moon rocket that could carry more cargo into space is NASA's Saturn 5 moon rocket, which last launched in 1973. Musk said the Falcon Heavy, made up of three Falcon 9 core stages powered by 27 upgraded Merlin engines generating a combined 3.8 million pounds of thrust, will be ready for its initial test flight from Vandenberg Air Force Base, Calif., late next year or early 2013. "Falcon Heavy sets a new world record for the cost per pound to orbit," Musk said. "That's a pretty huge leap in capability." With NASA looking to offload certain tasks in a bid to reduce expenses, SpaceX has emerged as the leading private space company. It has a $1.6 billion contract to let NASA use its Falcon 9 and 's Dragon capsule to ferry cargo to the International Space Station. A longer-term plan would involve Dragon capsules taking astronauts into earth orbit. It will be the most powerful U.S. launcher since NASA's Saturn 5 moon rocket. NASA is exploring options for an even more powerful, congressional-mandated "super heavy-lift rocket" for use in deep space exploration, but it's not yet clear when that vehicle will fly or what its mission will be. Musk said he expects initial demand to reach 10 Falcon Heavy launches a year if the test flight and subsequent launches go well. Potential customers include commercial satellite operators, NASA and the military, which Musk said currently plans to spend some $1.74 billion on four Air Force launches in 2012 at an average cost of $435 million per flight. SpaceX's single-core Falcon 9 rocket is available commercially for between $50 million and $60 million, the company said in a statement, while the new Falcon Heavy will cost between $80 million and $125 million, depending on requirements. "Falcon Heavy represents a huge economic advantage," Musk said. "Falcon Heavy costs about a third as much per flight as a Delta 4 Heavy, but carries twice as much payload to orbit. So it's effectively a six-fold improvement in the cost per pound to orbit. In fact, Falcon Heavy sets a new world record for the cost per pound to orbit of around about $1,000. That's a pretty huge leap in capability." The Delta 4 family of rockets is built and marketed by United Launch Alliance, a partnership between Boeing and Lockheed Martin that also builds Atlas 5 rockets. The Delta 4 Heavy, used primarily to launch large military satellites, is the most powerful unmanned rocket currently built in the United States. Musk said competitors claim SpaceX cannot deliver reliable rockets at the company's advertised prices, but he called that "a lot of wishful thinking." "I think we're unique in the launch business in publishing our prices on our web site whereas other launch providers sort of treat it like a rug bazaar, they'll charge you what they think you can afford," Musk said. "We believe in sort of every day low prices. We've stuck to our guns on that. The Falcon 9 costs $50 million, it's been that way for a while, and the Falcon Heavy is, on average, about $100 million. We're very, very confident of being able to maintain those prices. I say let history be the judge. Here I am saying it, we'll see if that remains true." SpaceX has a $1.6 billion contract with NASA to provide 12 Falcon 9 cargo flights to the International Space Station for delivery of more than 44,000 pounds of equipment and supplies after the space shuttle is retired. The contract may be expanded to cover additional flights, boosting its value to some $3.1 billion. Three Falcon 9 test flights are planned under a separate contract valued at up to $278 million. The first of those flights was successfully conducted last December. The company is lobbying NASA to combine the second and third test flights into a single mission that would deliver cargo to the space station. The 227-foot-tall 3.1-million-pound Falcon Heavy will be made up of three Falcon 9 rockets strapped side to side. Musk said the vehicle is designed to NASA's exacting human spaceflight standards, capable of withstanding 40 percent higher loads, or forces, than would be expected in a normal flight. Triple-redundant avionics systems are planned and the rocket will be able to achieve orbit even if multiple engines fail or shut down prematurely. Using upgraded Merlin 1D engines, each one generating 140,000 pounds of thrust at sea level, the Falcon Heavy will be capable of boosting 117,000 pounds of payload into a 120-mile-high orbit tilted 28.5 degrees to the equator. "This is a rocket of truly huge scale," Musk said. "The 117,000 pounds is more than a fully loaded Boeing 737 with 136 passengers, luggage and fuel. In orbit. So that is really humongous. it's more payload capability than any vehicle in history apart from the Saturn 5. And so, it opens up a range of possibilities for government and commercial customers that simply aren't present with current capacity. "If you compare our lift capacity to, say, the space shuttle or the Delta 4 Heavy, which are the two most capable vehicles in the world today, we're more than twice the payload capability of those vehicles." 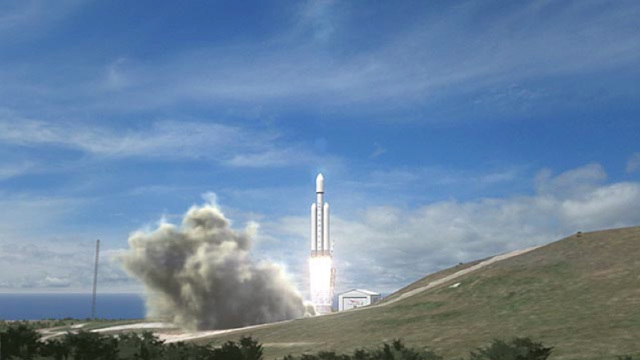 Along with launching large payloads to low-Earth orbit, Musk said the Falcon Heavy also could be used for eventual manned missions to the moon and other deep space targets, although multiple launches might be required. SpaceX builds most of its rocket components in house, including the Merlin engines. With 27 engines needed for each Falcon Heavy, Musk said "ramping up production is our number-one focus." "We're bringing in people, both from the rocket industry as well as from other industries, like automotive and high-volume aircraft production, because we'll be making more rocket engines than any country has ever made," he said. "Four hundred booster engines a year is more than the rest of world production combined. That's pretty serious scale in the rocket business." He said SpaceX should be able to maintain its advertised prices with a flight rate of just four Falcon Heavies per year. "But I'm very confident we'll be able to do that," he said. "And I think it's going to be a lot closer to 10 than four. Also, because of the commonality between Falcon 9 and Falcon Heavy, we're able to spread the overhead across both vehicles. Falcon Heavy is essentially the upgraded Falcon 9 with two additional first stages and side boosters. It's able to use the same tooling, be made on the same line." The first test flight at Vandenberg will be a paid for by SpaceX to prove the Falcon Heavy is a viable rocket. Subsequent flights will be launched from Vandenberg as well as the Cape Canaveral Air Force Station. "It's always possible a customer may jump in at the last minute and say OK, they'll do it, but it's a lot easier to get deals done if customers know they don't have to be the first flight.," Musk said. "So it's a slight risk on our part to be doing the first launch on our own funds. But it's an important thing to do in order to get customers to sign up."